You can purchase credits for 7.5cm super high resolution Nearmap aerial tiles for the United States. 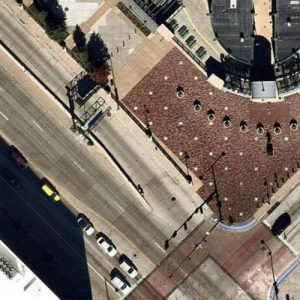 Learn more about Nearmap aerials. We offer the quick sample pack of 25 tiles for $10 and 250 tiles for $89. The image below (which can be expanded) shows the coverage area for 24 tiles at ‘max’ zoom. The area 24 tiles covers is roughly 1300’ x 820’ for the example shown, Millennium Park in Chicago. If using ‘high’ zoom, only 6 credits would be needed to cover this same area. Example: If your area of interest covers 30 acres, you would need to use 24 tile credits (30 acres / 1.32 tiles per acre) to cover the entire area at Max zoom level. If you use High zoom level you would need approx. 6 tile credits (30 acres / 5.29 tiles per acre) to cover the entire area. * Tile size is based on Denver, CO. Tile size varies with latitude.